Shopping around for bridesmaid gifts? Pop up the question to your girls with a personalized gift of love. Don’t know how to pick the perfect gifts for your bridesmaids? No worries, we’ll share some tips on how to choose and offer the presents. Obviously, when you ask someone to be your bridesmaid is a huge honor, but also a big responsibility. And you want to make sure you show your appreciation with unique bridesmaid gifts. Read more to find out how you can surprise your bridesmaids with some fabulous gifts that you may even want to purchase for yourself too. Dear ladies, we know you want to pick some splendid gifts for your bridesmaids and that you want to mark your special day in a wonderful manner. That’s why we created a list of essential questions that will give you a start. The answers will help you set a pretty accurate picture about how the bridesmaid and maid of honor gifts will look like. Next, we will show you some fabulous bridesmaid gift ideas that we guarantee they will make your job a lot easier. It all comes down to answering few questions. Next, we’ll guide your way on how and when to offer the “thank you” presents. Firstly, how many bridesmaids are you going to have? Do you want to have matchy personalized bridesmaid gifts or individual gifts? How many items do you want your bridesmaid gift to contain? What is your budget for the bridesmaids “thank you” gifts? Are you considering bridesmaid gift baskets/boxes? How soon do you want the gifts to arrive in your hands? Next, you should really take some time to plan this kind of gifts because there are other things that need to be considered. Scoring the perfect presents for your bridesmaids means finding the gift they really want! Or at least the gifts you think they want 😊. It’s not an easy task, but we’re here to help. 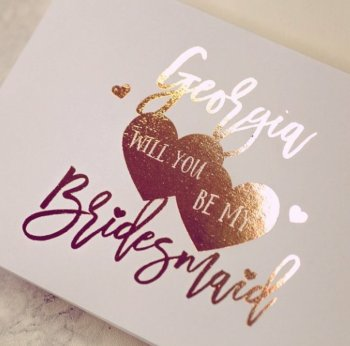 First of all, you should decide whether you want a gift for your bridesmaid that can be used only on your wedding day or a gift that will last for years and years. Just think about it.And if you have a budget for this, why not giving them something special and appropriate in the same time? We know it involves a bit more effort to offer a gift that can be used in the future as well, but you’ve only got a few girls that will always have your back. As a result, money can come second if you have a really special relationship with your ‘maids. And when you’ll see the bridesmaid gift ideas we picked, you’ll realize you don’t have to spend a lot of money to get them something meaningful and pretty. In the end, it all comes down to giving your bridesmaids something to be remembered for. Something special, unique, something that represents your bond and your love for them. How expensive should be the bridesmaid gift? There’s no limit in terms of how much you want to spend. However, try to be reasonable and consider the number of bridesmaids. If you’re having three girls, then you can be more generous. Seven bridesmaids can be a challenge, but not an impossible mission. There are product sets that can represent inexpensive bridesmaid gifts due to the fact that you’re buying them in a larger number. Also, a good tip would be to buy them during the sales season or to use discount coupons that most of the brands are using on certain times. So, if you have spotted some nice things that you think your bridesmaids will love them, make sure to put the products in your shopping cart or on the wish list and wait until they have discounted prices. The best way is to subscribe to their newsletter. In this way, you’ll know when the prices drop or when they have special offers. What are some practical bridesmaid gifts? There are several items that caught our eye while planning this article. Thank your lovely ladies for helping you down the aisle with at least one of these bridesmaid gift options. 1. Cards – before offering the actual gift, you need to ask the question. And not just anyhow, but with style. This kind of personalized cards are absolutely gorgeous and they will totally be appreciated! Follow @theinvitepress on IG. Check them on Etsy as well. The photo is from their account. Follow @theinvitepress on IG. The photo is from their account. 2. Matchy robes – robes and PJs are an excellent choice if they are made of quality fabric. Decide on the initials (color and font) and make sure to order them a long time before the wedding just to make sure you have everything way ahead of time. This is absolutely a nice, cute way to get everybody matching in the wedding pictures and the video. Take a look at these robes and pajamas. They are exquisite! Follow @sandywatersstore on IG. The photo is from their website. Follow @allthingsnicestore on IG. The photo is from their account. 3. Hangers – hangers are a great idea in case you want a personalized gift for your bridesmaids. Moreover, it will be a wedding related gift. You can have their first name or initials on them with an elegant writing. What’s more is that you can incorporate them in the wedding theme and have them decorated accordingly. Here are some beautiful options. Follow @hangersbychelsea on IG. The photo is from their account. Follow @_letterlee on IG. The photo is from their account. Follow @hangers.couture on IG. The photo is from their account. 4. Pearls – a pearl bracelet is the perfect bridesmaid gift because it will actually represent a memory wrapped in a classy and elegant manner. Offering the same bracelet to each of them can also represent your friendship bracelet. Round shapes symbolize the infinity, so what better way to interpret the long-lasting nature of your friendship? If you really want to make a statement and offer a special gift to your bridesmaids, then this pearl bracelet is the ideal present. Everyone will fall in love with it and will cherish it for years. Not to mention that the beauty of pearls is timeless, so the pearl bracelets will never go out of fashion. Oh, and earrings are also a beautiful choice. Check this Pearl Earring Set in White Star. 5. Mugs/Cups – now this is a unique bridesmaid gift that can be used in the daily life for sure! Coffee or tea will taste sweeter in the mug you offered to your bridesmaid. Take a look at these mugs! It would be awesome to just sit and enjoy your favorite drink all together! Follow @creativjuicedesigns on IG. The photo is from their account. Follow @mugmood on IG. The photo is from their account. 6. Bridesmaid gift box or bag ideas – you get to chance to get super creative and come up with multiple items that can be stored in a chic, charming box. As you may have guessed, the box can be of various shapes and textures. Some elegant and stylish choices are the ones we point out below. What we love about custom gift boxes is that they allow you to add various products such as candles, charms, personalized make up bags, flats and the list goes on. It would be lovely to have her name written on the box or the bag. Just imagine their reaction! Follow @buorx on IG. The photo is from their account. Follow @lepapertales on IG. The photo is from their account. Follow @kmecandles on IG. The photo is from their account. Follow @acharmedlifescarborough on IG. The photo is from their account. 7. Flats for dancing – make sure your bridesmaids are able to dance all night long with a pair of flats. Sure, heels are nice and they are great for pictures, but there will come a point when their feet will need some rest. So, pamper and rescue your ladies with a pair of shiny flats. Plus, your girls can wear them on other occasions too! Follow @rescueflats on IG. The photo is from their account. When is the best time to give your bridesmaids their gifts? Well, we imagined several scenarios, but in the end, is totally up to you. The bridal party is good moment to offer the bridesmaid gifts if you’re planning to invite a small group. If you’re planning a big bachelorette party, then you should keep them for later. You don’t want to offer the gifts in front of the persons who will not receive a gift because it will be weird. One week before your wedding day you can organize a small and intimate get-together. Invite just your bridesmaids and your maid of honor and surprise them with style! The rehearsal dinner is also a good context because it will give you the opportunity to make a candid toast to the ladies and speak about how much they mean to you. After this, hand out their presents and be ready to overwhelm them with hugs 😊. If you don’t have a lot of time, then you can definitely surprize them on your wedding day. Just make sure to have all packed. In the end, we hope you enjoyed our selection of unique bridesmaid gift ideas. We totally love these ideas because they are useful, practical, special, and with a touch of glam. These features will guarantee that they will be used and remembered for the next years as well. Thank them for their loyal friendship with a gorgeous gift they’ll love and want to use. They totally deserve it! This entry was posted in PearlsOnly by PearlsOnly Team. Bookmark the permalink.